Mother Nature dropped by Rangers Ballpark unannounced last evening, unleashing a thunderclap at the Rangers-Twins game that evacuated the bowels of all in attendance. Twins outfielder Denard Span claimed "That's the loudest noise I've ever heard. I thought Jesus was comin!" on his Twitter account, while fellow outfielder Ben Revere chimed in, "My heart stopped when I heard the thunder at the stadium. Glad no one heard me scream like a little girl too!! Lol." Rangers authorities were quick to point out the lightning struck outside, not inside, the stadium, though the reaction from fans & players suggests it was plenty close regardless. 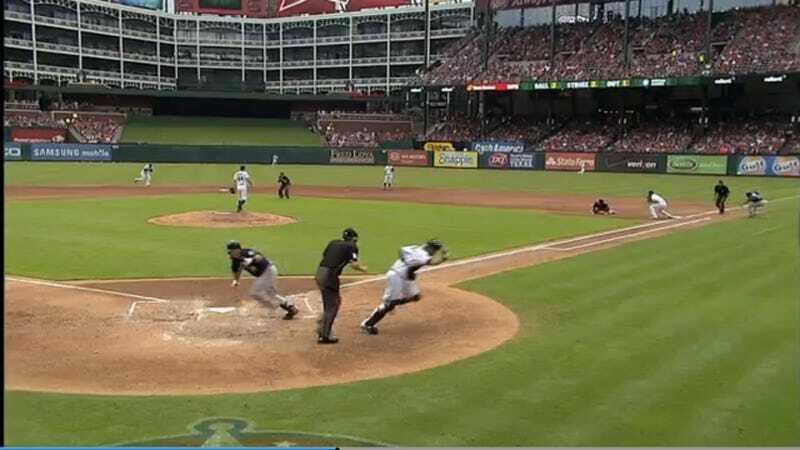 The weather caused a 45-minute delay that didn't help fans get home for work Monday morning as late-inning defensive mistakes by the Twins allowed Texas to push across three late runs to force extras, eventually won with a 13th-inning Ian Kinsler walk-off single.